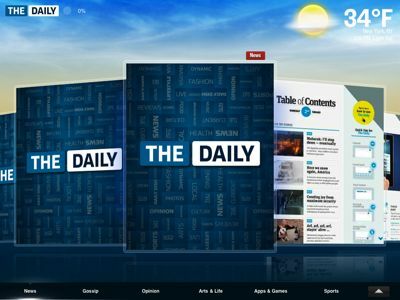 Apple’s Newstand product has helped digital publishers reach a broad new audience and the company benefiting most from the product is News Corp. who’s iPad-only publication The Daily is currently the number one subscription service on the program. With 120,000 subscribers, 80,000 of which are paying readers the program has managed to beat out major publications including the New York Times, National Geographic, Wired and the New Yorker. Revealing “The Daily” numbers for the first time News Corp. officials says of their 80,000 subscribers most of them are paying the company’s $39.99 annual rate rather than the more expensive (at least in the long run) 99 cents-per-week option. In the meantime The Daily still has a long way to go before it reaches the company’s goal of 500,000 paying subscribers, the number of people needed for the paper to break even according to News Corp. founder and CEO Rupert Murdoch. Are you a current The Daily subscriber? Why have you chosen to pay for the publication or why have you skipped it all together?